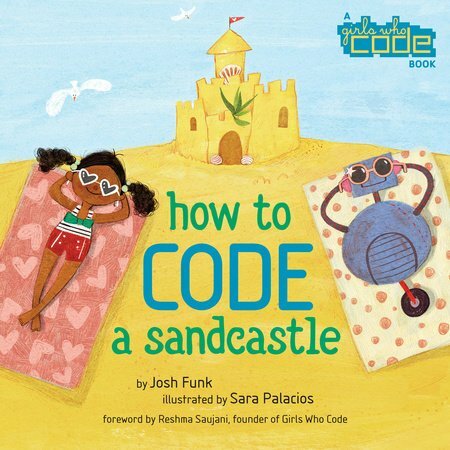 How to Code a Sandcastle by Josh Funk – He Had Me at CODE! Having a website, I know a little bit about coding, little being the operative word. But author Josh Funk, a software engineer by day, knows a lot. Thankfully. 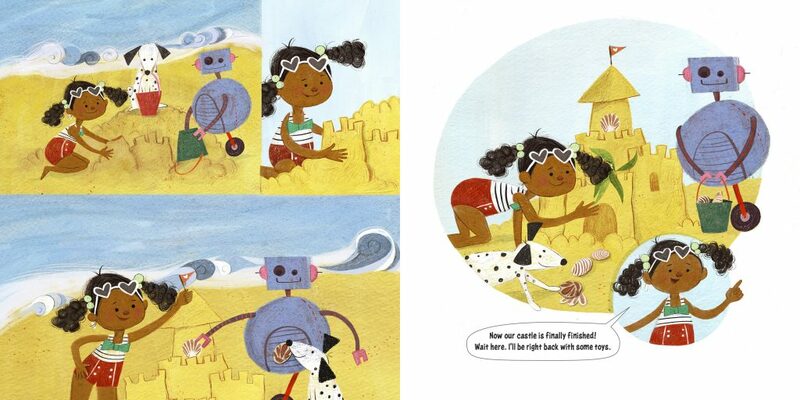 So it’s no surprise that the end result of a Funk and illustrator Sara Palacios picture book collaboration, How to Code a Sandcastle, has yielded such a positive and inspiring read. Beaches and bots, hmmmm … I had absolutely no idea before picking up my review copy how author and illustrator would pull off this phenomenal feat. I mean, millions, maybe trillions of grains of sand and machinery don’t exactly go together. That’s why I felt compelled to read on and am glad I did! Interior artwork from How to Code a Sandcastle written by Josh Funk and illustrated by Sara Palacios, Viking Books for Young Readers ©2018. Narrator Pearl is spending her last day of summer vacation at the beach. She’s determined to build a castle because all of her previous attempts have been thwarted by freewheeling frisbees, slamming surfers and peeing pups. Today, however, she has her “trusty rust-proof robot, Pascal,” in tow who she will code to build a sandcastle. Code, your children will learn, is “special instructions that computers understand.” But Pearl soon realizes that in order to build said sandcastle, her instructions need to be specific because without doing so, Pascal could end up constructing the castle in the ocean or in a parking lot. We also see that there’s a sequence to the problem solving, a good tip for young readers just learning about the importance and practicality of executive functioning. So after 1. Finding a suitable place to build, it’s onto 2. Gathering up the sand, encompassing a three-step process of filling, dumping and patting down. 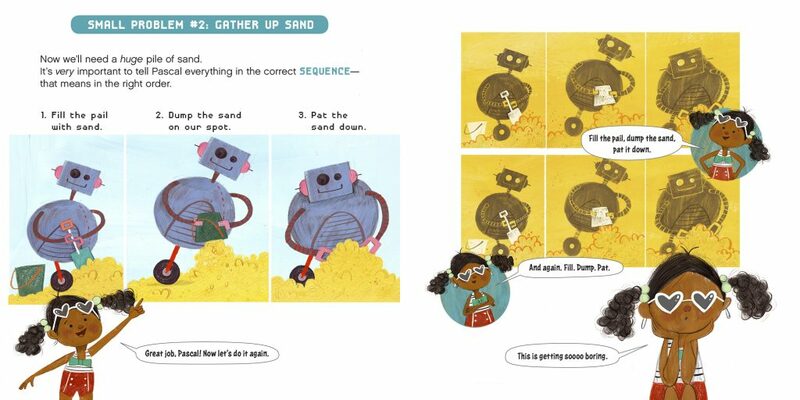 Here’s where a coding trick called looping is introduced: repeating the three step process or sequence until all the steps are done and the sand is piled in place before moving on to 3. Shaping and decorating. When Pascal brings items to decorate the sandcastle that aren’t appropriate (a lifeguard stand, a live crab and a baby’s binky! ), plucky Pearl relies on a cool approach called IF-THEN-ELSE to help the robot analyze what can and cannot be used. When a wave washes away the masterpiece, Pearl doesn’t get discouraged because she has the key to quick and easy re-construction, the code that Pascal can implement. Only now she needs to program Pascal with a way to protect the sandcastle, a code for how to build a moat! Once that’s finished, there’s no telling what else they can do with their coding know-how. What a great way to end vacation! Funk’s story is funny, creative and easy to follow. By using something as recognizable as a sandcastle for the coding project, How to Code a Sandcastle serves as an ideal vehicle for a gentle, accessible preview of computer science. If only we all could be assisted by robots when we head to the beach. Imagine the possibilities! In her illustrations, Palacios has combined sunshine, sand and STEM in a thoroughly modern and cheerful way. Pascal the robot, who is never portrayed as cold or remote but rather charming and accommodating, is someone any child would want as a friend. And Palacios’ diverse characters fill the pages with a realistic picture of what readers really see when they visit the beach. A two page spread of back matter, “Pearl and Pascal’s Guide to Coding,” explains all the code concepts covered. If you never thought you or your youngster would get the concept of coding, it’s time to think again. With its goal of getting girls to embrace coding, Girls Who Code will, with the help of wonderful books like this one, succeed in closing “the gender gap” that currently exists in the technology fields. 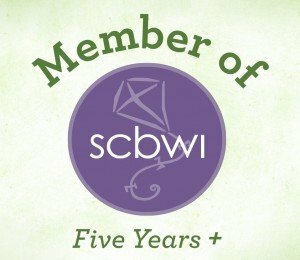 Start your own STEM-themed collection of books by visiting your local independent bookstore today. 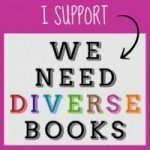 Read a review of another Josh Funk book here.